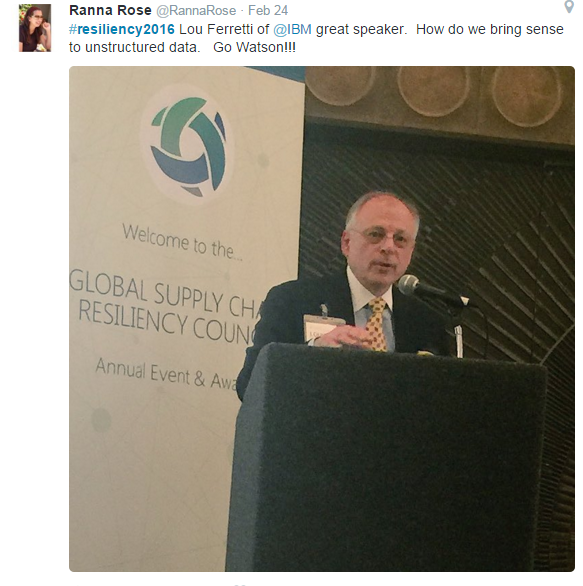 Supply Chain Risk Management & Supply Chain Resilience: Is There a Difference? I hear the terms supply change risk management (SCRM) and supply chain resilience used interchangeably by industry practitioners, stakeholders, solution providers, and industry analysts alike. So, are we essentially talking about the same thing or do we invoke one term over the other in certain circumstances to convey something different? For all practical purposes, both terms describe the same business discipline and process and, as such, cover the same ground when you break down the concepts into its various components. However, the message that they each evoke is very different. They both describe the same “glass”, but one describes the glass as half-full (resilience) and the other half-empty (SCRM). While risk is something you want to minimize, resilience is something you want to maximize. Risk is a threat, while resilience is an opportunity. For example, in terms of value propositions, the messages that flow easily from a discussion of SCRM are around cost and disruption avoidance, vulnerability identification and remediation, and other operational and tactical concerns. On the other hand, supply chain resiliency connects more easily with strategic themes like competitive advantage, market share, and ultimately brand and shareholder value. For example, companies that recover faster from a supply chain disruption event through early detection and crisis response preparation, or avoid its impact altogether as a result of proactive planning, can gain a time-to-market and market share advantage over competitors that depend on the same suppliers and components to ship product. Studies have shown that the loss in market share and shareholder value from supply disruption events can take a decade to recover from, not to mention the brand/reputation impact of having to delay shipment. Both the SCRM and resilience value propositions are real and compelling and relevant to the growth of SCRM/Resilience as a critical business discipline and function moving forward. One resonates with sourcing and supply chain operations professionals, while the other piques the interest of the C-suite. The discipline of SCRM/Resilience will reach escape velocity when the operations folks can drive the C-level messages up the chain and the C-suite can drive “buy in” from the top down with a viable operational improvement message. So while the strategies and tactics to manage risk and achieve resilience may be the same (e.g. qualify additional/alternate sources for high revenue-at-risk components; improve supplier collaboration and planning; design products and supply networks for resiliency, etc. ), the benefits may be perceived and valued differently. Let’s continue to use both terms because they both matter, but let’s also be aware of their nuances and evoke the term that is likely resonate most with whomever you are talking to. Download the Ultimate Guide to Supply Chain Resiliency Program Success to learn tips on how to sell your SCRM/Resilience initiative to any audience. 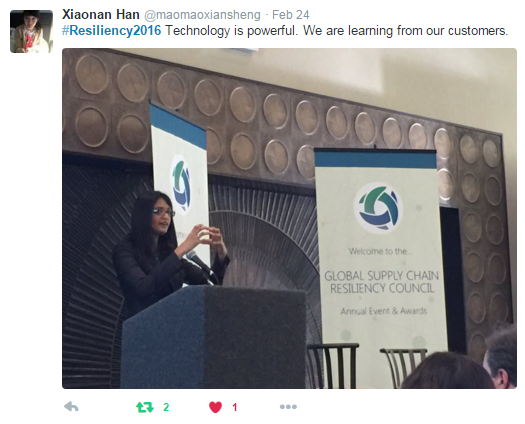 The winners of awards for supply chain resilience and risk management excellence were honored by the Global Supply Chain Resiliency Council at its annual event which took place on Wednesday, February 24th, 2016, at the Sheraton Palo Alto, in Palo Alto, California. This year’s event attracted over 100 attendees from all over the country. 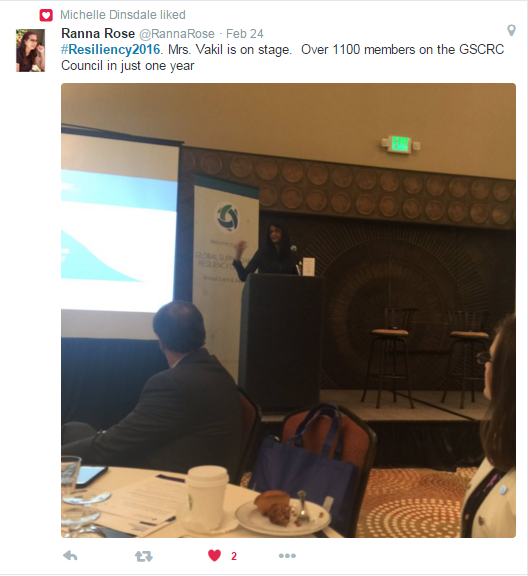 There are now almost 1,100 general members of the Resiliency Council. Its goal is to bring together supply chain risk management (SCRM) and resiliency practitioners with industry experts and thought leaders to advance the professional discipline through opportunities to collaborate, develop and share best practices, and be recognized for innovation and leadership. The awards program is one of the key elements of the Resiliency Council’s strategy to accelerate enterprise adoption of supply chain risk management and resiliency as a professional discipline and mission-critical business process. This award was based on a number of criteria and input related to customer collaboration practices and culture, technology adoption, and overall breadth and maturity-level of processes in place, as well as the organization's commitment to institutionalize best practices and demonstrate innovation and continuous improvement over time. Vonnie French, vice president supply chain operations, Rachel Yabut, senior project manager, and Dmitriy Krichevskiy, risk manager, accepted the award on behalf of Palo Alto Networks. This award goes to the company that has done the most to advance the SCRM and resiliency discipline both within their company and across their industry. The industry leader is early to adopt advanced SCRM and resiliency processes and technology and is closely watched by its peers. As such, the company serves as a role model for industry peers via its commitment to institutionalizing SCRM processes and best practices and track record of achieving benefits and results. The industry leader also generously shares experiences and lessons learned with peers at industry events. Patricia Turney, executive director of supply chain, Rod MacLea, director of supply chain, and Martin VanTrieste, senior vice president of quality, accepted the award on behalf of Amgen. This award recognizes the company that is most advanced in terms of technology adoption, the use of technology to achieve customer-supplier collaboration, and the overall maturity-level of technology-enabled processes and best practices in place. In addition, the committee considered organizational culture as it relates to technology adoption and risk taking, as well as the organization’s commitment to leveraging innovation and driving continuous improvement over time. Steve Darendinger, vice president supply chain, and Mark Graham, director supply chain, and Ashu Gupta, senior manager, risk & analytics, accepted the award on behalf of the company. This award recognizes the educator that best supports further development of university-level education programs focusing on supply chain operations and resiliency and is best preparing the next generation of supply chain risk management superstars with hands-on training using real life scenarios, tools and case studies. In addition to talent development, this award also recognizes educators that play an important role in cross-pollinating ideas and strategies between academia and the business community. 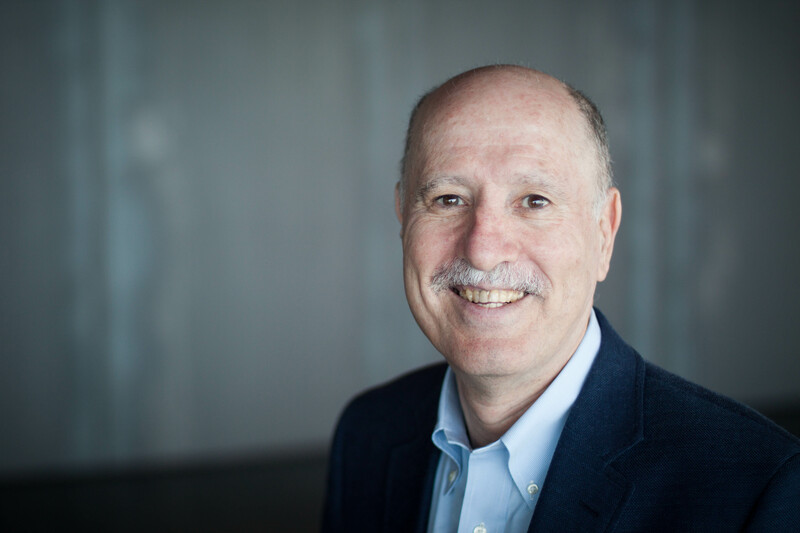 Yossi Sheffi is the Elisha Gray II Professor of Engineering Systems, MIT and the author of several books including the recently published The Power of Resilience. This award recognizes individual success in championing the importance of supply chain resiliency within one’s company and being a change agent. The individual’s efforts to advance the profession–by sharing best practices, collaborating with key supply chain partners on successes and lessons learned, via active participation in industry events and media communication opportunities – was also a consideration in the selection process. Jamie Love is vice president of global operations at Sigma Aldrich. This award recognizes the supply chain partner that collaborates most effectively with customers for mutual benefit. The Collaborator of the year is proactive, responsive, transparent, willing to share appropriate information, and committed to working with its customers to achieve multi-enterprise supply chain performance excellence, KC Wong, principal field applications engineer, and Clifford Bast, senior global manager, accepted the award on behalf of HGST. The Global Supply Chain Resiliency Council is a professional community and network for supply chain risk management practitioners, leaders, and stakeholders. The principal goals of the Council are to (1) bring together SCRM and resiliency practitioners with luminaries and thought leaders to advance the professional discipline through opportunities to collaborate, share best practices, and be recognized for innovation and leadership and (2) elevate the profile of supply chain risk management and resiliency challenges and opportunities vis-a-vis the C-level strategic agenda. 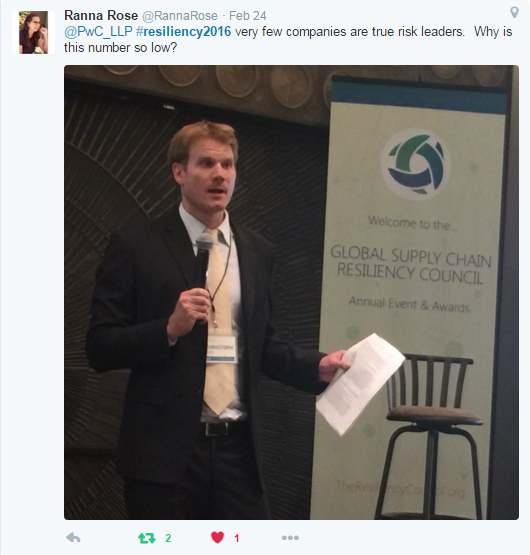 The Global Supply Chain Resiliency Council has over 1,000 general members and has an open membership policy. Interested individuals within the business community and academia that wish to become a member of the community can do so by joining the LinkedIn discussion group by the same name. 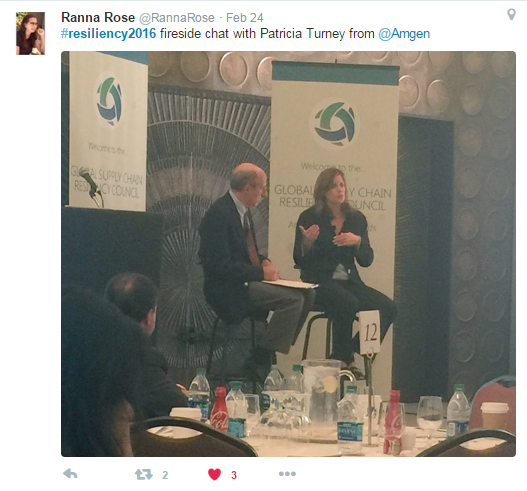 Join the #Resiliency2016 Conversation on Twitter! Yesterday marked the conclusion of the 2nd annual Global Supply Chain Resiliency Council conference and awards event. With over one hundred supply chain practitioners in attendance from around the world, the amount of collaborative knowledge and best practices shared made it an event for the books (at least, within the supply chain community!). 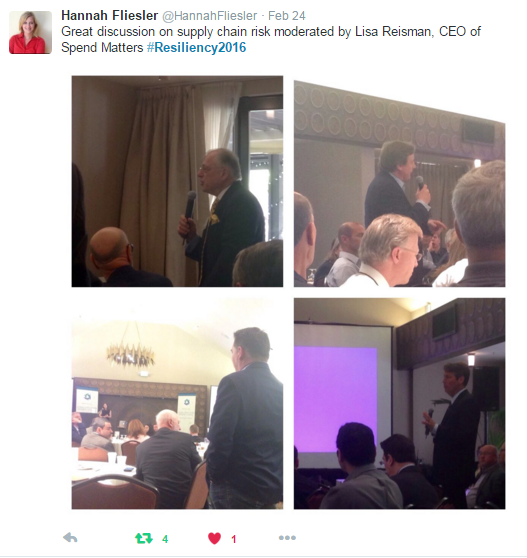 Some of the most brilliant minds in the supply chain risk space, from IBM's Lou Ferretti to MIT's Yossi Sheffi to Amgen's Patricia Turney, presented their takes on global supply chain risk and resiliency. 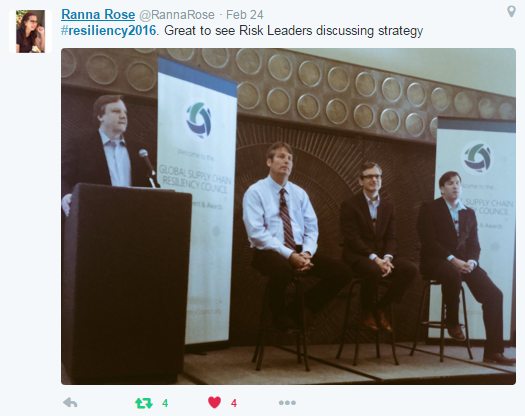 As the event was held over two days, the hashtag #Resiliency2016 emerged early on during the conference and gained momentum in the Twitterverse. The great thing about Twitter is that digestible nuggets of information and wisdom can be instantly broadcasted at the touch of a button and filtered by utilizing hashtags. 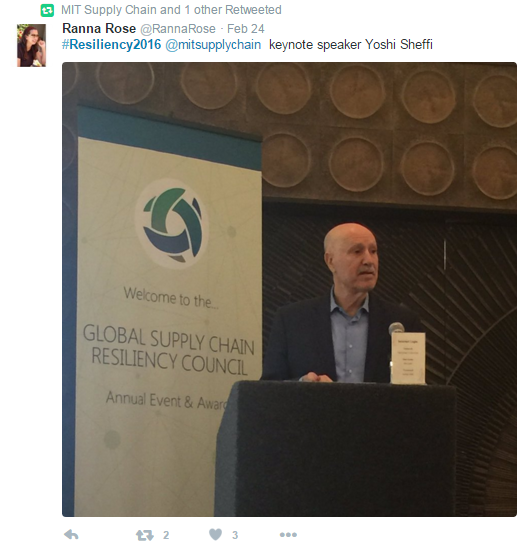 As such, many attendees (including myself: @resilient_neil) took to live-tweeting #Resiliency2016 to share the loads of valuable information they gathered from the event's sessions to the online supply chain community. 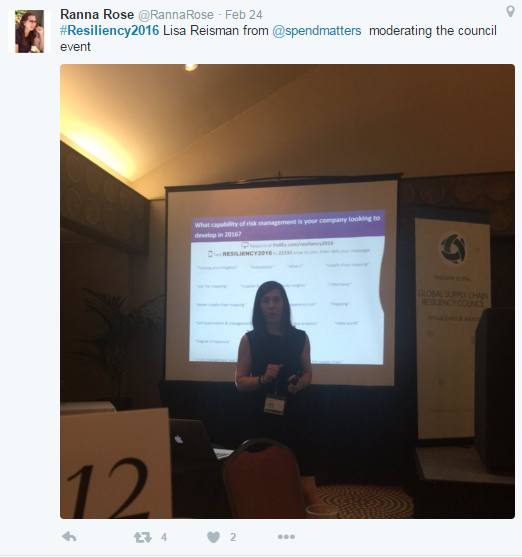 As only a portion of the tweets spurned by the event are presented below, be sure to check out the #Resiliency2016 hashtag to get the full scoop. Supply Chain Resiliency Management (SCrM) is a growing area of interest and study. Yet it can be daunting to sift through the swaths of information to find relevant tidbits on social media sites like Twitter. 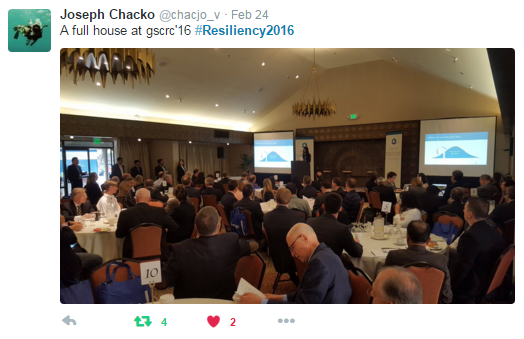 While the #Resiliency2016 hashtag was born out of the recent GSCRC event, let's take it a step further. We invite the supply chain community at large to use this hashtag, not only to bolster discourse, but gain visibility to target audiences. 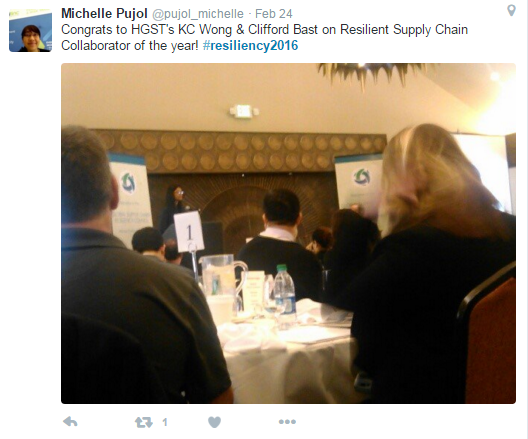 By keeping #Resiliency 2016 alive and trending, we can keep the online conversation surrounding supply chain risk and resilience alive in an easy-to-find nook in the Twitterverse. Don't get lost in the flurry, hop on #Resiliency2016! Around 4 a.m. on February 6th, a 6.4 magnitude earthquake rattled southern Taiwan at the start of Lunar New Year, the island’s largest nationwide holiday. With a current death toll of 114, it is the deadliest earthquake to hit the island since the “921 Earthquake” of 1999. Taiwan is the world’s leading producer of semiconductors and integrated circuits (IC), and high tech companies are wondering how this earthquake could affect the global electronics supply chain. 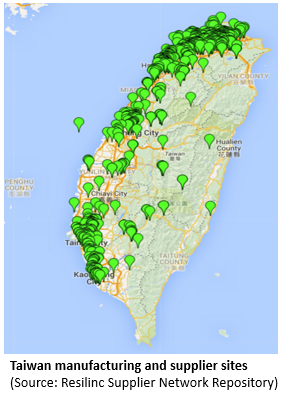 While initial reports of the quake emphasized minimal damage and interruption to the major chip foundries concentrated in southern Taiwan, there are less apparent global supply chain impacts that will likely be felt in the near future. The report discusses the specific and confirmed impact to major semi-conductor, electronics components and assembly service providers including UMC, Innolux, and ChipMOS, and warns that there are many other smaller manufacturing operations in the affected area that have not released a public impact statement. The analysis concludes with several specific recommendations for addressing the lingering potential risks associated with the Taiwan quake as well as steps that should be taken now to avoid impact from future similar events. For example, high tech OEMS and brands should assume their competitors, as well as other companies from other industries, are vying for available inventory, capacity and freight bandwidth. Companies should also conduct mapping exercises to determine which sites, products, parts, and materials are derived from southern Taiwan and which may be impacted by the quake and then monitor and collaborate with suppliers to mitigate evolving risks. Finally, Resilinc implores brands to take steps to proactively mitigate future vulnerabilities that will be exposed by similar incidents by investing in supply chain risk management (SCRM) and resiliency strategies and program initiatives. This includes people processes and technologies for (1) proactive risk identification, quantification and prioritization and (2) rapid crisis detection and response via 24x7 global event monitoring and analysis services. Resilinc has published its 2015 supply chain events annual report which summarizes and analyzes nearly 750 unique supply chain alerts and notifications generated by the EventWatch® 24x7 global event monitoring, alert, and analysis service in 2015. 2015 saw a high-level of disruptive supply chain event activity as several significant events occurred throughout the year, from the major chemical explosions at the Port of Tianjin to numerous chart-topping typhoons in the critical Asia-Pacific region and the arrival of El Nino in the latter half of the year. Evident in the report, numerous geo-political, macro-economic, social/technology and environmental trends continue to impact global supply chain continuity. The annual report analyzes global supply chain incidents and trends according to risk type, industry, geography, severity, and seasonality, comparing 2015 data in these categories with 2013 and 2014. The report also includes the EventWatch Top 5™ Supply Chain Events for 2015, a key takeaway for supply chain practitioners. In this post, we provide an overview of the report; however, for a closer look at our data graphs, trend charts and analyses, check out the full EventWatch Annual Report. A key takeaway from the annual report is the EventWatch Top 5™ supply chain events of 2015. The top 5 events ranking is driven by the estimated aggregate revenue impact from the highest-impact events reported by EventWatch throughout the year. The estimated revenue impact is calculated by leveraging Resilinc’s database of over 80,000 suppliers and approximately 1.5 million parts which are tracked by Resilinc’s cloud supplier intelligence repository. Typhoon Goni - Taiwan, China, Japan, Korea, Philippines. 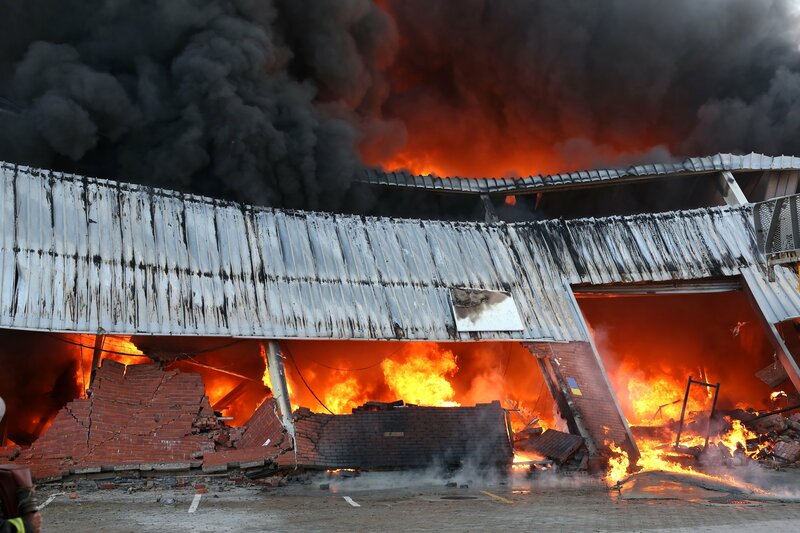 Event Type: For a third year in a row, factory fires/explosions were the most commonly reported supply chain disruption event and represented 17% of total EventWatch bulletins in 2015. Industry: From 2013 to 2015, the automotive industry was the most frequently impacted industry, but a narrow margin over the reported incidents that impacted the high tech and life sciences industries. Geography: In 2015, the majority of supply chain events reported by EventWatch emanated from Asia, followed closely by North America. However, in 2014, North America produced the lion’s share of supply chain events reported by EventWatch. Seasonality: In 2015, the three most impactful months to global supply chains were December, August, and September/March (tied). December was characterized by an unusual increase in factory fires/explosions, the impact of El Nino (which peaks during winter time), and increased merger and acquisition activity toward the end of the calendar year. August had a rare spike in activity due to the devastating Tianjin explosions and their subsequent disruptions. 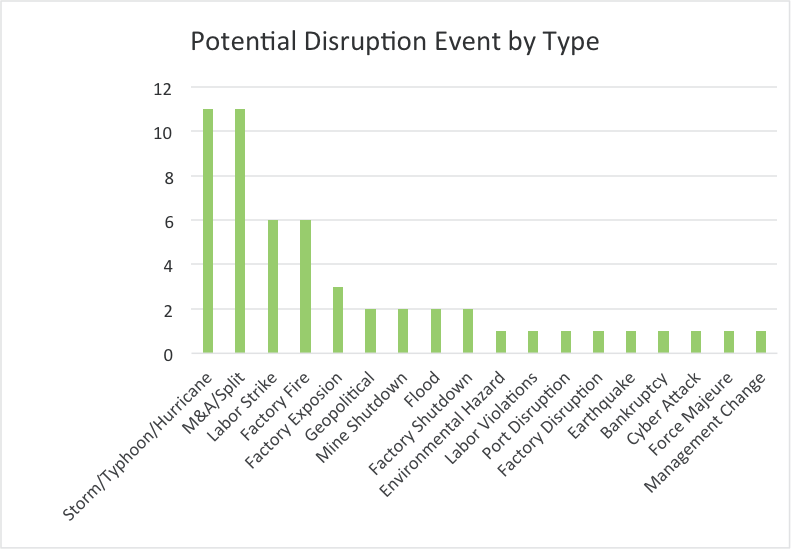 Event Severity: Medium potential for disruption events were most common in 2015 and comprised 52% of all EventWatch bulletins, consistent with current supply chain impact research that suggests smaller, more frequent disruptions can be more costly in aggregate than those caused by high-impact, infrequent events. 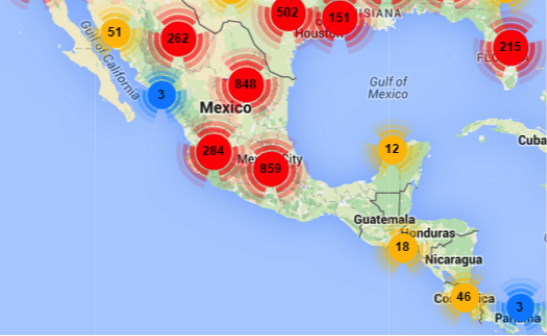 In 2015, medium and low-impact events represented around 90% of Eventwatch bulletins. While these are only highlights of the report, please check out the full report for trends charts and analyses, data graphs, and a deeper discussion of supply chain risk in 2015. For those unfamiliar, the EventWatch Annual Report aggregates, analyzes, and summarizes supply chain event information generated by the EventWatch service. The EventWatch Annual Report helps supply chain risk practitioners, analysts, and executive stakeholders understand global supply chain risk trends through various lenses, answering questions like: Which event types are most common or becoming more common? How does my industry compare to other industries in terms of the number of events experienced? Which regions are impacted the most? What months see the most supply chain disruptions? Compared to other “Top 10 Supply Chain Event” lists, the Eventwatch Annual Report is uniquely driven by data and focuses on upstream impacts to specific brands, suppliers, sites, and parts, based on calculated value-at-risk. Resilinc’s rapidly expanding supplier repository contains risk information associated with over 80,000 suppliers and 1.5 million parts, and already on-boarded suppliers represent up to 90% of a company’s upstream supply chain. This is in contrast with other publications that provide more qualitative assessments based typically on estimates of damage to public or shared infrastructure, which invariably steers the focus toward downstream/logistics-related disruptions. 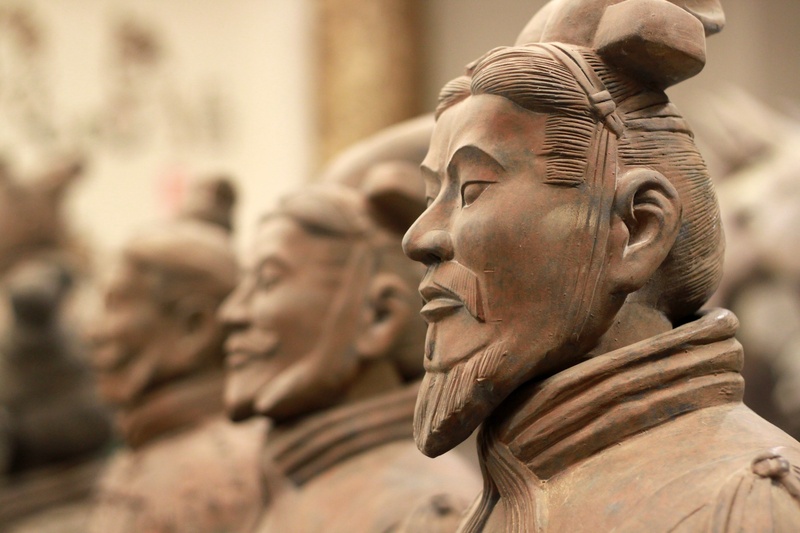 How Can Sun Tzu’s The Art of War Help Your Supply Chain Resiliency Planning? Before else, let’s be clear – supply chain resiliency and military engagement are not the same thing. Hundreds of years ago, during times of mass territorial warfare in historic China, Sun Tzu wrote The Art of War as a wise compendium for the keen general on how to better manage an army, outwit an enemy, and minimize casualties on the battlefield. The Art of War preached proactive strategies to most efficiently conquer an enemy and minimize losses. Interestingly enough, much of Sun Tzu’s insights are useful when appropriated to the context of supply chain resiliency. For us supply chain geeks, there are too many nuggets of wisdom related to modern supply chain risk management for a keen business manager to pass up. So let’s reassemble the context: think of supply chain disruptions as the ‘enemy,’ the global terrain of your supply chain as the ‘battleground,’ and the ‘war’ is establishing supply chain resiliency while anticipating the risks associated with a complex web of materials and services through informed precision. In our context, supply chain resiliency planning is not the process of working through pre-established lists, but the necessity of quick and appropriate responses to changing conditions. In the text’s first chapter, “Laying Plans,” Sun Tzu lays out the five factors that determine the outcome of any military engagement, and in our case, the success of a resilient supply chain: (1) the Way; (2) heaven; (3) earth; (4) the commander; (5) method and discipline. For our purposes, these five elements can be classified as the unexpected, seasons, terrain, leadership, and management. That said, think of how the unexpected will always challenge your supply chain resiliency. These unexpected disruptions are akin to ambushes. No matter how well an organization plans in advance, unexpected disruptions are inevitable splinters and can greatly damage operations. Thus, being prepared for disruptions before/as they happen is crucial. Utilizing 24/7 global supply chain event monitoring services can enable swift responses, giving your organization and leadership a competitive advantage by identifying supply chain disruptions as they happen. 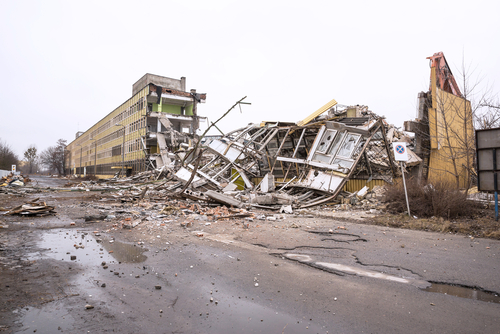 Similar to the battlefield, proper mitigation strategies can help organizations avoid tremendous capital losses, identify sluggish cogs in their supply chain, and be better prepared for future unexpected disruptions. In short, know the disruption before the disruption knows you. Is there a region in your supply chain more inherently prone to risks and disruptions? Since most supply chain disruptions are rarely publicized and don’t make it to mass media sources, do you have a way to obtain locally-sourced news related to supply chain disruptions? Does your organization have alternative sources and sites in more stable regions? Is there transparency in your company’s supply chain mapping? 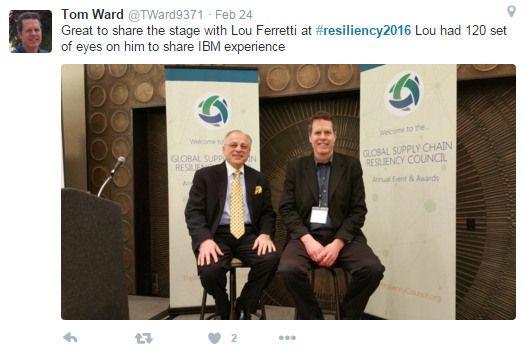 Has your organization invested in supply chain resiliency solutions? The key strategy is understanding the difference between supply chain risks and supply chain resiliency. Dealing with supply chain risks is inherently reactive, while building supply chain resiliency is a proactive process requiring preemption, investigation, and planning. Similar to balancing an army’s attack and defense strategy, knowing how to handle supply chain risks while building a resilient supply chain is a golden balance. To do so, utilizing the proper intelligence is critical to maintaining such an operation. In The Art of War’s final chapter, “The Use of Spies,” Sun Tzu emphasizes the advantage of spies and intelligence to gather pertinent intelligence so that one can make the right move at the right time. Sly connotations aside, think of supply chain disruption monitoring services as your loyal spies dedicated to providing customized insights and strategies for the health of your company’s supply chain. Black swan supply chain events have been traditionally associated with (if not formally defined as) improbable, rare, or unlikely events that have severe or even catastrophic business impact. However, as a result of a number of socio-economic factors it’s time to update our view of black swan supply chain events. For a number of reasons, black swan events are becoming less rare. It may sound logically inconsistent to describe such events as both becoming less rare and at the same time improbable or even unimaginable. How can that be? It’s important to distinguish between the unique characteristics or circumstances associated with a singular event and the collective probability that at least one of these singular events will happen over a given period of time. After evaluating the surrounding context, looking backward domain experts (and in some cases even laymen) can usually conclude most black swan events are bound to happen and are destined to repeat themselves. Only the Chicago Cubs seem to defy this principle. Even though some parameters may differ (such as the event’s time, location, or specific type), it is likely that many similar incidences have had similar effects in the past and that this will continue in the future. SCRM Lesson: While black swan events may make headlines, they should be addressed with the same basic approach as all other supply chain disruption events and risks. According to Sheffi, a general capability and process needs to be developed to proactively identify, quantify, and prioritize risk scenarios for mitigation, as well as processes for early detection and rapid crisis response. After all, business impact of every day minor supply disruptions and delays in aggregate typically far surpasses that of the less frequent, but more severe black swan event. Now that we are more comfortable with the notion that black swan events—though in many cases unimaginable, are not rare—it’s a small leap to accept that black swan events will happen with increasing frequency. Note, a key element of our black swan supply chain event definition is the degree of business impact. Globalization means that the impact of events is less localized and therefore more impactful. Further, a key driver for extreme weather-driven black swan supply chain events is climate change – a socio-economic challenge that will not be addressed or reversed anytime soon. Moreover, technology and hyper-connectedness of suppliers, brands, and OEMs make cyber disasters more likely and impactful. Finally, escalating geopolitical unrest can be one element of a perfect storm resulting in a black swan event. SCRM Lesson: Don’t be preoccupied with the rarity, the unprecedented, or unimaginable nature of black swan events. This leads to a defeatist and illogical conclusion that supply chain risk management is futile. Focus on mitigating the business impact regardless of event timing, severity, type, location, etc. with proactive risk mitigation strategies prioritized by value-at-risk. Hurricane Katrina (2005) may be considered a black swan event, but not because disasters of that magnitude were unprecedented, unimaginable, or that its particular location and specific type was unforeseen. Everybody knew that the city of New Orleans is at the base of a geographic soup bowl, whose brim once breached could lead to epic flooding. Hurricane Andrew back in 1992 raised that spectre. What most could not imagine is that an extreme weather event could wreak that much havoc in the U.S., and how poor the disaster preparation and federal crisis response could be. SCRM Lesson: Planning and response preparedness can head off a potential black swan event before it goes down in history as such. In sum, the general answer is to build a resilient enterprise that anticipates, prepares for, and responds rapidly to all types of events, ranging from the severe “black swan” variety to every-day supplier disruptions and delays. Hurricane Patricia – the strongest hurricane ever recorded in the western hemisphere – made landfall on the Pacific coast of Mexico on Friday, October 23rd, around 6:15 p.m. local time. The supply chain event impact, while still being assessed, clearly can be characterized as minor, especially when compared to relatively recent historic extreme weather events such as Hurricane’s Katrina and Sandy and other “acts of god’ such as the Japan Earthquake and Tsunami and the Thailand floods of 2011. It is nevertheless significant as it represents the first weather event with the potential to impact supply chains that can be definitively linked to the El Niño weather pattern. 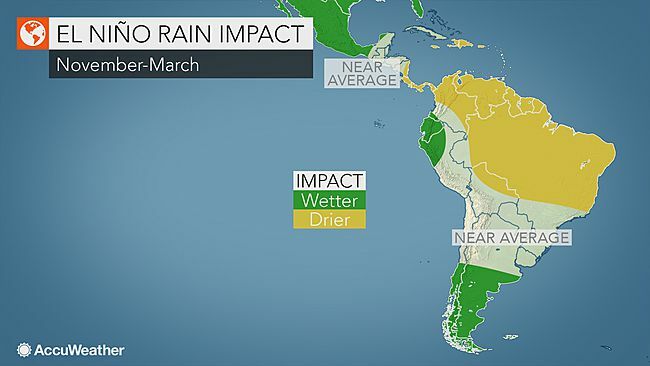 Several events running up to Patricia have been postulated to be linked to El Niño. These include Typhoon Soudelor (August), Hurricane Etau in Japan (September), Typhoon Dujuan in Taiwan and Eastern China (September), and even the air quality crisis in Singapore and Malaysia (September) caused by Indonesia forest fires associated with El Niño induced drought conditions. However, based on the consensus of scientists and climatologists (including those at NASA and Stanford University), the connection between Hurricane Patricia and El Niño is not in the realm of conjecture, but rather reality. We have been warning our clients and the broader supply chain management professional community for months to take proactive mitigation actions in preparation for the impending El Niño. In a recent impact analysis white paper entitled El Niño: A Test of CPO Leadership and Your Supply Chain Resiliency Culture, we argued that El Niño is unique in that it is perhaps the only supply chain disruption phenomenon in which the general timing and geographic location of the potential impact is known well in advance, providing a unique opportunity to plan and prepare. It concludes that if executive leadership is blindsided by El Niño, they have no one else to blame but themselves. The good news is that it’s not too late to get started. We are only in the first inning of a nine inning ball game. There is no more time to waste, but it is not too late to identify your areas of geographic exposure to El Nino driven extreme drought and precipitation conditions. The next step is to map suppliers, sites and parts at risk, and then proactively quantify and prioritize mitigation opportunities based on revenue-at-risk. Although fears of a major catastrophe did not materialize, as there were no immediate reports of any deaths or damages to major infrastructure, the potential for supply chain impact from Hurricane Patricia for companies with significant supplier exposure in the western coast of Mexico (specifically the states of Nayarit, Colima, and Jalisco), was daunting. The Pacific coast of Mexico is home to numerous automotive, high tech, life sciences, and other industrial manufacturing facilities, as well as port and freight operations. Key companies in the region include Flextronics, America Movil, Mexichem, Grupo Mexico, Pacific Coast Energy and Minerals LLC, and Ciudad Industrial Morelia. But, in the end supply chain impact appears limited to minor work operation disruptions from localized wind damage, floods, and mudslides impeding workforce transportation and the flow of goods in-and-out of southwestern Mexico. According to experts, the favorable outcome can be attributed to two factors: preparation and luck. As reported in the Sunday New York Times (“Mexico Exhales After Surviving A Giant Storm,” by Azam Ahmed and Paulina Villegas, October 15, 2015), the Mexican authorities learned some hard lessons from inadequate responses to earlier responses. Mexico now has a national emergency response system that coordinates with authorities at the local level. Federal and local officials were effective in proactively moving people out of harm’s way, and after the storm responded quickly to clear roadways and begin to restore power and communication lines. Despite the effective planning, the impact still had the potential for devastating if not for a lucky break. The path of the storm passed between two major cities, Puerto Vallarta and Manzanillo, but hit neither directly. It then quickly dissipated 12 hours after touching ground when it veered into a mountainous region. The key take-away from the Hurricane Patria experience is that luck, or hope if you prefer, is not a strategy. Enterprises should follow the lead of the Mexican government and invest in proactive risk mitigation plans and post-event emergency response preparedness. Hurricane Patricia represents perhaps your final wake-up call. For those who prepare, global supply chain disruption events are viewed not as threats but as opportunities to gain competitive advantage. We just prepared a report for Rx-360 leadership on potential supply chain disruption events over a recent three-and-one-half week period of time. The supply chain events were all detected and reported by our 24/7 EventWatch® global event monitoring and analysis service. I thought I would share some data we rolled up over this “snapshot” period of time. It sheds some light on the frequency and diversity of types of events that hit the life sciences and biotech global supply chains every day. For those of you who are not familiar with Rx-360, it is a not-for-profit consortium led by volunteers from the Pharmaceutical and Biotech industry including both manufacturers and suppliers. The purpose is to enhance the security of the pharmaceutical supply chain and to assure the quality and authenticity of the products moving through the supply chain. The EventWatch® team issued 53 potential life sciences and biotech industry-specific disruption event bulletins over a 24 day period starting on September 23 and ending on October 16. That’s a little over 2 (2.2) potential disruption events per day. All events included were determined to be relevant to life sciences and biotech from a supply chain business continuity perspective, although some clearly have a more direct impact. Over that period, there were no events with a “severe” disruption potential. There was only one that was given a “high” disruption potential: Fire Reported at Braskem Plant in Sao Paulo Brazil (10/15/2015). There were 32 “Moderate” and 20 “Low” potential impact events. As you can see, Severe Weather Events and M&A/Splits were by far the most common events, followed by Labor Strikes and Factory Fires. The top 4 categories accounted for 62% of the events. The weather-related events can be expected to spike since this is “hurricane” season in many geographies. The plethora of mergers, acquisitions, and divestitures in the life sciences and biotech industry during this reporting period is noteworthy. We typically see factory fires and labor strikes (although to a lesser extent) to be a major source of disruptions across all industry supply chains. The rest of the event profile consists of a large number of event categories (14) with a small number of incidents (1 or 2). The number and diversity of events makes it very difficult for companies to monitor on their own without a dedicated 24/7 team with access to all traditional and social media channels and the ability to track events reported in all major languages. But, it’s not enough to just detect and monitor events. You need a process and analytic technology that connects the dots between events and the impact to your specific suppliers, sites, parts, and value-at-risk. This enables you to respond rapidly, mitigate further risk, minimize time-to-recovery, and even turn the threat into an opportunity to gain a competitive advantage. Leading global brands and OEMs in the life sciences, including several Rx-360 member companies, high-tech, automotive, and other industries rely on the EventWatch® supply chain event monitoring service in combination with the Resilinc SCRM solution suite to maximize business continuity and gain a competitive edge. While weather conditions for vessels operating in the Panama Canal recently improved, it may still be too soon to predict the final supply chains impacts which companies that depend on the canal face as a result of El Niño. The El Niño weather pattern, characterized by warmer temperature changes in the Pacific Ocean near the equator, led to drought conditions in some regions. In Panama, drought conditions already affected 70% of the country2 causing Panama's government to issue a 60-day state of emergency in early August. Specifically, widespread drought and substantially low water levels of Gatun and Alhajuela Lakes—a primary source of water for the Panama canal—are affecting its operations. Imposed restrictions on ships with drafts (i.e., depth in water) greater than 11.89 meters (39 feet) went into effect roughly a month ago on Sept. 8. To comply, vessels would need to lighten cargo loads or companies may need to reroute ships along other paths if their vessel drafts are not reduced. Additionally, while the Panama Canal Authority initially anticipated further draft restrictions on Sept. 16, the organization recently released an update that such restrictions would be postponed. According to the update, “Vessels arriving after Sept. 8 with drafts over the limit of 11.89 meters may be allowed to transit the waterway depending on the water level of Gatun Lake at the actual time of transit.3” Up to 18.5% of ships are impacted by the initial draft restrictions. Delays in the availability of products, parts and raw materials. This could impact time-to-market and revenue. Because of the extensive traffic in the canal, delays could amount to 20-30 hours on average, according to the WGBH Educational Foundation. Hidden sub-tier impacts to your supply chain or its related industries (i.e., impacts in one industry can impact other interdependent industries). For example, many chemicals and raw materials are derived from agricultural products (e.g., palm oil) and fish (fish meal) that are used in life sciences and even the high-tech industry. Panama has a significant agriculture and fishing industry that has already been impacted by shipping restrictions. This could lead to increased costs and decreased product availability. Monitoring updates related to the current drought and draft restrictions. Creating what-if scenarios to assess potential impacts on inventory, shipments or product availability. Identifying alternative sourcing or shipping lanes in the event of backup inventory consumption or product/part disruptions or sever delays. Resilinc will continue to monitor this situation closely. For early notification and analysis of supply chain events, consider subscribing to our EventWatch services.